KuCoin’s pool of cryptocurrencies has remarkably increased. Because of their ongoing development and additional programs, more and more blockchain based projects are trusting this platform to include their native currencies. 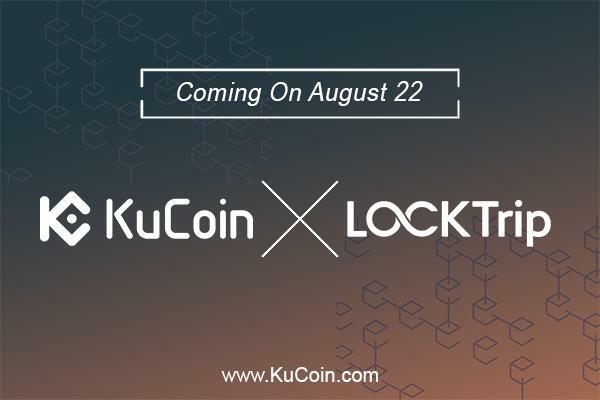 Today, KuCoin is thrilled to announce that they have listed Locktrip LOC token to their network. Deposit is now possible with trading pairs including LOC/BTC and LOC/ETH. Buying commence at 19:30 UTC+8 while selling and withdrawal at 20:00 UTC+8. LockTrip was developed and organized to accommodate an open and decentralized source for rental bookings. It is the first system that can enable the owner of the property and the end user to transact freely inside its platform. It can regulate any transactions and interactions in the middle of hotel/property providers and its clients. Inside the system, there will be some guidelines and processes administrated by smart contract set in EVM. LOC Ledger keeps all the transactions and manages the execution of every transaction. Furthermore, it runs only with the LOC tokens. However, applications that wish to join the engine can have additional value services like the conversion method for their payments. It can be completed by integrating external currencies or by using internal algorithms. It is the unchanging part of LockTrip. As the utility token, it grants access to the LOC Ledger. If anyone purchases LOC token, they open the complete service capabilities of the decentralized booking marketplace. It will assist customers to reserve accommodation and hotels, rental properties or have other related services. Owners can accept this form of the token as the client’s payment. They can make a withdrawal of those on the LockTrip.com marketplace and other platform associated to it. Other currencies in the form of fiat and crypto are accepted but may have 1% – 3% charges. The post Locktrip LOC Is Now Available At KuCoin Cryptocurrency Exchange Platform appeared first on CryptoPotato.